Alex Chang makes it home from Sean Heiduk's bunt in the fourth inning. The maxim that “little things make a difference” is affirmed in millions of ways every day, but perhaps never so explicitly as in the game of baseball. 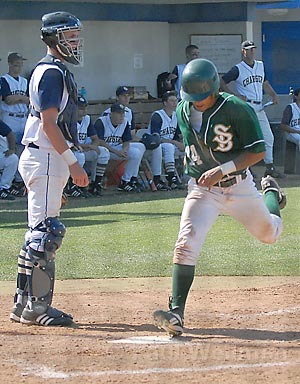 Case in point: The key hit in Santa Barbara High’s 4-0 victory over Dos Pueblos last Friday, April 27, was a bunt. 4-2. The final tally of runs scored in a span of 21 innings showed six for each team. Dos Pueblos was the home team on Friday at UCSB’s Caesar Uyesaka Stadium, an appropriate setting for a game that featured several future college ballplayers. It had the feeling of a championship game-a large crowd was on hand, and Brad Ebner, the celebrated DP football player who is recovering from a brain injury, threw out the ceremonial first pitch. The score was 0-0 in the top of the fourth inning, and the bases were loaded with two out when Santa Barbara’s Sean Heiduk came to the plate. It must have been tempting for him to swing away. But the Dons had been frustrated all too many times by the alert Dos Pueblos fielders, who backed up the solid pitching of Dan Martony and, on this day, Chris Joyce. “We have to work our way around the bases against them,” Dons coach Fred Warrecker said. Coaching at first base, Warrecker noticed DP third baseman Brad Armstrong was playing deep. He also took into account that Joyce, a left-hander, was facing away from third. Warrecker gave the bunt sign. “If he could get it down, it’s a run,” he said. Getting it down was the challenge. How often nowadays do major leaguers seem inept at the art of bunting? Alex Chang dashed home, and the Dons scored three more runs on a walk and a two-run single by Zach Chavez. Santa Barbara hurler Crosby Slaught did the rest. The 6Ê¹5Ê° senior shut out the Chargers, although they threatened with base-runners in almost every inning. “He just didn’t cave in,” Warrecker said. Townsend reminded the Chargers that, with a one-game lead over Santa Barbara, they control their own destiny. Regardless, having won more than 80 percent of their games, both the Chargers and Dons appear destined for postseason play in CIF Division 2. The fundamental skill of both teams reflected the quality of the coaching. Warrecker has been guiding the Dons since 1973. His best rival and best friend in the ranks was Scott O’Leary, who coached the Chargers for 34 years. O’Leary died of cancer in 2003. The Dos Pueblos diamond bears his name, and the Chargers wear his initials and number (SO-1) on their caps. “Scott wasn’t just about Dos Pueblos baseball,” said Val Reveles, a former DP player who now helps Townsend. “He was about all baseball in Santa Barbara.” O’Leary’s hallmark was his positive attitude. “He made the game fun for the kids,” said Reveles. Townsend played shortstop on Warrecker’s first team and later worked with O’Leary. “Scott developed in me a passion for coaching,” Townsend said. It’s the coaches who agonize over the game. “You never get it right,” Warrecker said. “The night after a game and all the next morning, I wonder if anything could have been done differently.” Last weekend, at least, he could relish his decision to bunt.